Nestled deep into wild shrubbery on Brazil's Quinta da Baroneza golf course isStudio Arthur Casa's newly completed home called Casa HS. Casas gave the 11,000 square foot home a fully transforming exterior! 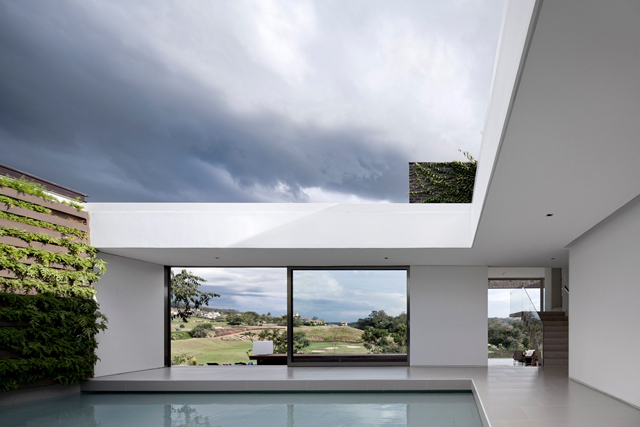 Brazil is celebrated for its moderate weather, and the architect is known best for his impeccable capability of marrying of nature and architecture - it only makes sense to built a home where the walls can spring open and invite the great outdoors in. 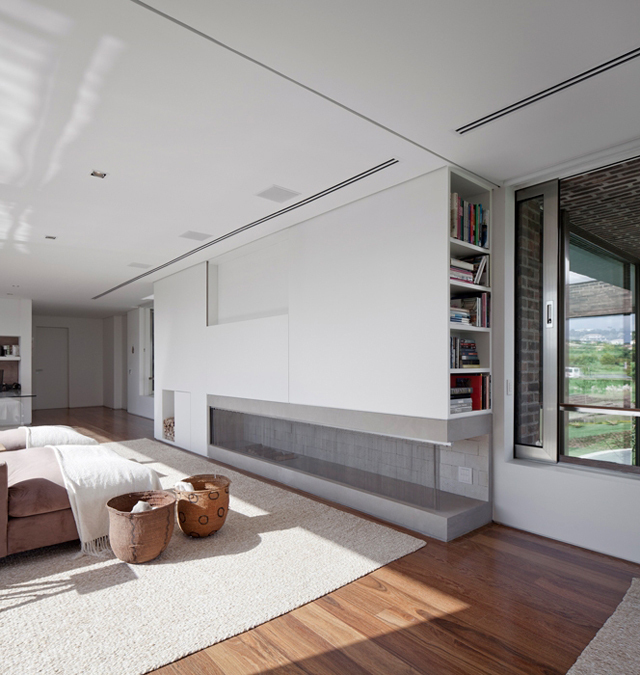 The house is compartmentalized into two dividing areas, each area has two levels. One area is designated for the children and guests, while the second area consists of common spaces and the master suite. The common areas is divided from the master suite by having the living room, kitchen, and dining room on the ground floor, and the master bedroom and bathroom with complete privacy on the upper level. 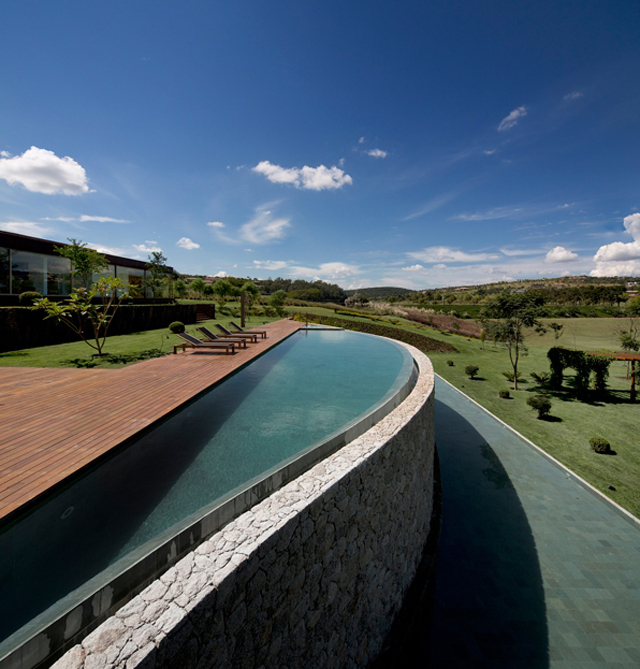 The two separated areas of the home are joined by an open square pond with a rising vegetation wall on its side. 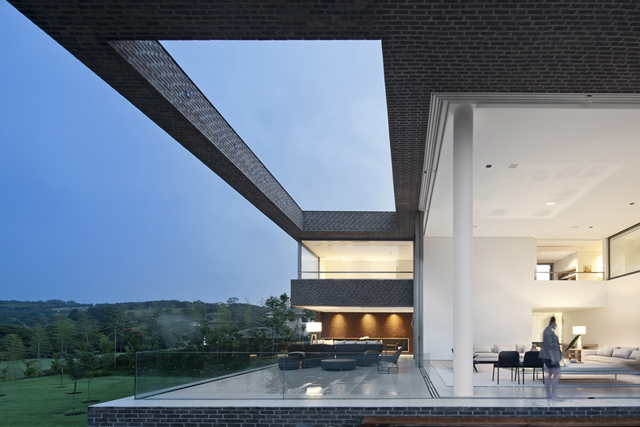 The facade is constructed out of perforated metal panels which open and close in the bedroom areas. The perforation adds privacy from the street, but insiders can still take advantage of the surrounding landscapes. The home has a modern aesthetic, but is amazingly warm and inviting with it's natural brown tones mixed with stark white gallery styled walls. Minimalistic interiors allow for the architecture to be showcased, while equally letting in the views of the natural surroundings, which is better than even the fines piece of canvas.